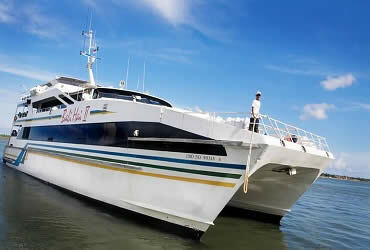 Bali Reef Cruise is a Bali Cruise Tour Package by offers a full day of fun activities for your family. Our luxury catamaran departs Benoa harbor at 9.15am each day to cruise from Bali to Nusa Lembongan where it moors alongside our purpose-built pontoon, which is packed with activities for the whole family. Other cruise activities include unlimited banana boat rides, a cultural tour of Lembongan Island or our exciting 35 meter waterslide. The Bali Reef Cruise is on of the island's top family activities. And when you've finally worked up an appetite, feast on a delicious buffet served in air-conditioned comfort aboard Bali Reef Cruise Ship.